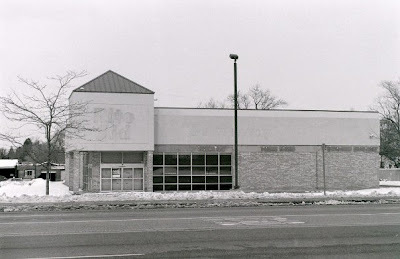 Damn, I didn't know Rite Aid's could go out of business. Only the true survivor's can make it in Flint. Dunno when these were taken, but nowadays the geolocation features of digital cameras these days makes this job a snap! I demand that we rely on our deep knowledge of Flint geography on this one. Of course I can I.D. 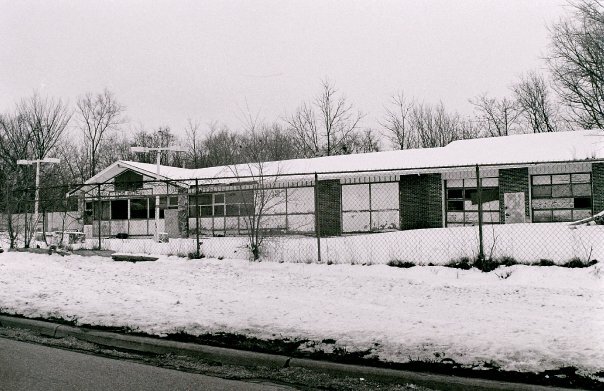 Haskell Community Center and the old Merlin's Retreat on Fifth. I could ID all of these given enough time... please give the # of the pic (numbering top to bottom) and the intersection! 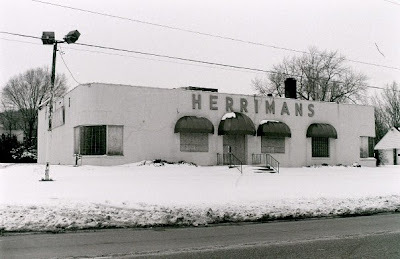 #25 Herriman's Ice Cream - Clio Rd/Cold Water Rd. I numbered them for easy reference. 7 and 8 look like the old flower shop on Court near the White Horse. #5 is on the corner of Fenton Rd. & 12th. St.
#7 The two story building is the old Curtis Flowers on Court St. near Ann Arbor St.
#13 is on Chippewa St.,near Louisa St., the back of the buildings in #2. 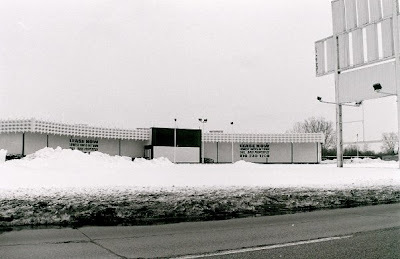 #24 was the Flint Odyssey Car Wash on M.L.King. Merlin's was the first place I ever had vegetarian food not prepared by myself specifically labeled as such. Of course I remember it previously as Fifth Avenue Grill. Isn't 27 the old Jerry Davidson Buick and 29 the old Blain Buick, both on Clio Road? 2 is right behind St. Mike's, probably gone now for the construction of the new IRS building. Best banana split in Genesee county is represented. I wish - I wish. Spent money in a lot of these buildings. #6 was (according to rumor) a former bean processing plant. I was in it back in the early 90s with a bunch of other people celebrating the 4th of July. There was a British guy who expressed interest in purchasing it and turning it into a nightclub. 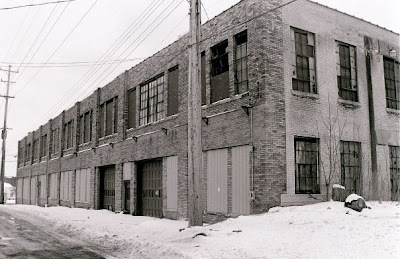 #18/#20 is the same building located on Saginaw St. just a few blocks north of St. Michaels and was at one time going to turned into lofts according to the sign on display for a few years. I peeked inside once since its one of my favorite abandoned Flint buildings and noticed a boat parked inside. #15 Was at one time owned by Bob and Wilidine Williams, family friends. Years ago, I noticed that the wizard sign was on display at a new location off of Corunna road right across from Showcase Cinema. 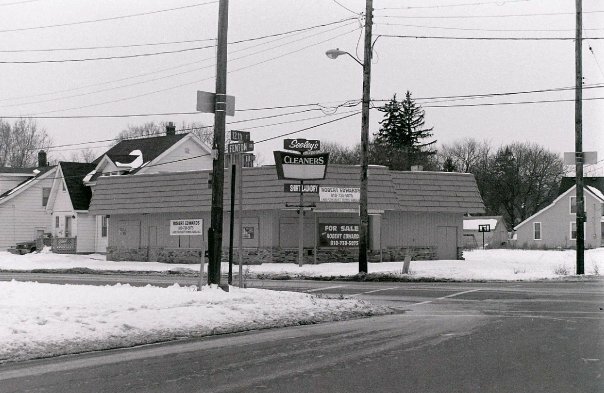 I believe #21 is Stanley's Meat market on Flint Park Blvd. My Dad grew up down the road. Isn't #22 an old hardware store on MLK? 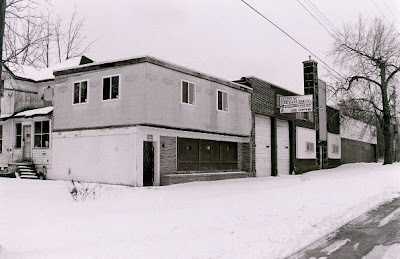 Yeah, there was a ramshackle and dusty motorcycle shop downtown.I was in it a few times.Seems to me it had wooden floors. Not sure if it specialized in Indians but that certainly would add to the cool factor. Yes, #6 is near Kearsley and Grand Traverse just a knife throw from the Torch. #2 is definitely the old building next to St. Mikes. The new IRS building is there now. They've got windows up and everything. I don't know why a) they are moving there and b) why they don't tear the abandoned building behind it down for parking. I think #14 is also at Chippewa and Louisa Street (the opposite angle of #13). I go to St. Mikes every week. #27 and #30 are definitely on Clio Rd. No. 22 looks like the old Gillroys hardware store on Detroit street, (MLK? ), near Pasadena. 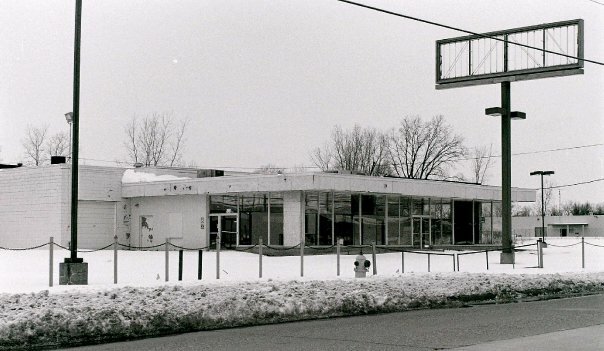 I remember the shiny new Schwinn bicycles on display in that second floor display window. I wish you could do a photo spread of the good stuff too. The U of M, the Kettering, the Durant, The new builds and restores downtown. The fancy restaurants. Maybe even a photo of the Billions and Billions (okay I exaggerate) served by the Back to the Bricks and the Crim. There are billions and billions of good photos of Flint on the blog. Scroll through and you'll see them. Okay, not billions, but lots and lots. The goal is some semblance of reality, so compelling shots like Austin's will always have a place on the blog. 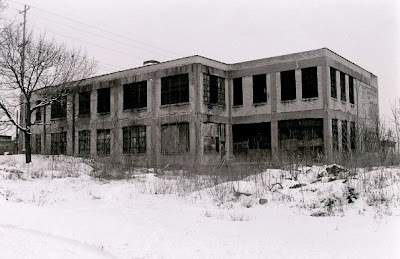 Plus, this is allegedly a blog for Flint expats, and I was struck by all the memories these now empty buildings sparked. But there's no doubt I drop the ball on Back to the Bricks every year. Not sure why. August is always a busy month for me, but that's no excuse. Gordie was just in Flint for Back To Bricks - I only goto Flint once a year now and that's the weekend I pick. Why? Because it's as good as Flint gets on any weekend. It's white as hell due to the influx, but so many people are there that all sorts of folks of every color stripe and persuasion come down to see what the fuss is all about and you have yourself a (little bit) of a melting pot. Last weekend was pretty legend, got a tour of Joel Rash's office and forthcoming loft space, met tons and tons of new contacts, saw the "new" Churchill's, drank $2.50 drafts at 501, bar hopped around and was always surrounded by tons of interesting people. Go next year, we'll tag team on a photo journalism piece. Anonymous and the ramshackle building with wooden floor..... It was indeed Indian Sales. 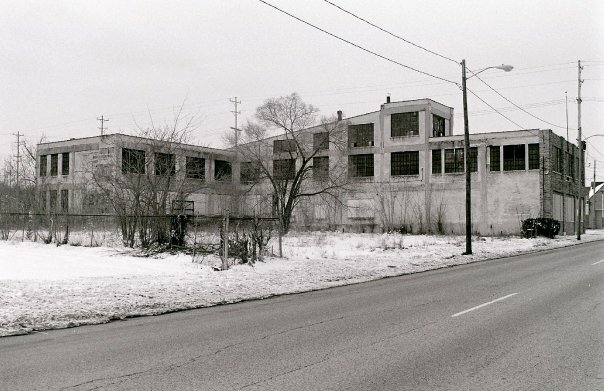 Just a short walk North on Saginaw beyond the Durant on the West side. 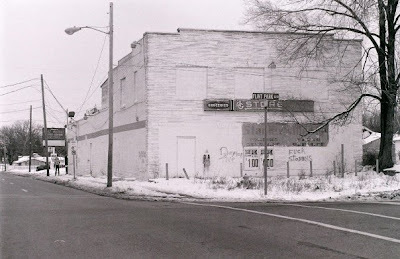 I believe it was the only Atlas Indian shop left in Flint in the fifties. It was a neat place then. #1 kind of reminds me of the building just south of Dollar General (the old "Hickory Meat Block"/"Feke and Yott" store) on Franklin and Thom. I don't remember a fence out front...plus...that building at the far right (which is right) would have been the boarded up 7-Eleven. Great studies- Austin has a wonderful eye. 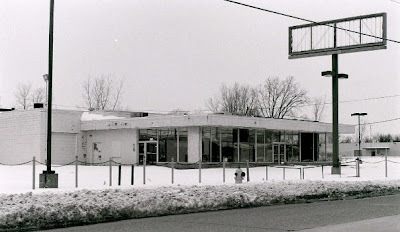 I went to the grand opening of Jerry Davidson Buick as a child- what a contrast. 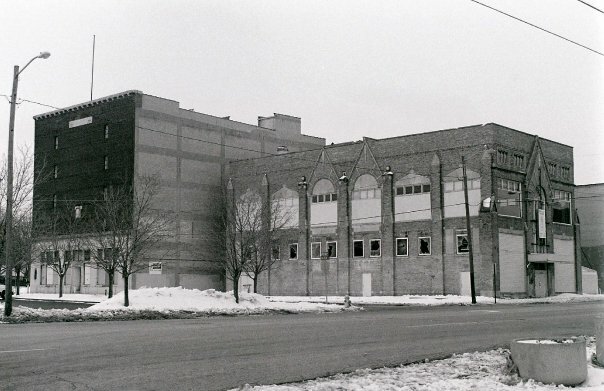 Remember Blain in its heyday with the "Spring Special" colors on the Regals? And is #30 Salem Lincoln Mercury? 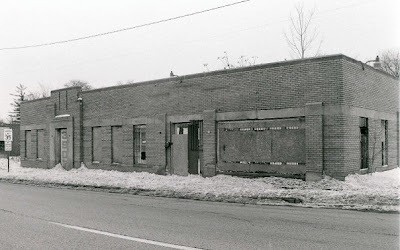 Thanks for the confirmation on the Indian Motorcycle shop on N.Saginaw St. In my mind it was becoming a fragment of a memory and I wasn't exactly sure I had the details correct. I'd like to see even MORE photos of Flint. The good, bad & ugly. Maybe some of you have seen the photography project in which a hundred photographers spend an entire day capturing a city from midnight to midnight. The people and the little known places etc. There certainly are enough folks with digital cameras to make it happen. Anybody know of the mansion on Branch Rd. just behind Hampstead? Thats my old neighborhood and I remember that it was owned by one of the Hamady Brothers for only about a year in the late 1930s, but he moved due to a family death. The property is about 15 acres and butts up to the Flint River. I remember it had cement steps decending down in the backyard into the river. Yes I went there in the 70's, have some great memories. I drove past there a few years ago, decided to drive up that long narrow driveway. It's not nearly what it used to be, run down terribly. Photo #20 looks a lot like the Michigan Bell Telephone Company "Woodstreet" garage. You could park the line trucks inside the building on the second floor via indoor ramp. If you use Bing.com and type in Hampstead + Flint and then click map. You can find the former Hamady Mansion that you are referencing. If you look at it in Birdseye view it is quite impressive! Its a mammoth castle. I never knew it existed. Thanks! I remember the Hamady House had activities for school girls and one of the groups was called Stepping Stones. The kids used to go out there and spend a weekend. I had forgotten about that until Anonymous mentioned something about the stairs behind the building going down to the water. Thus..stepping stones. Maybe? The Stepping Stone Club got it's name from a piece of verse: "Each must make ere life hath flown/ A stumbling block or a stepping stone." That verse was on an early brochure for the program, under a photograph of Elizabeth Pollack, the woman who stated the Stepping Stones Progam in 1938. From 1943 through 1975, the club members spent a week or more at the old Michael H. Hamady Clubhouse -- the mansion on the river. #1 is, I believe, at the location of Lewis Street and Bennett Avenue. 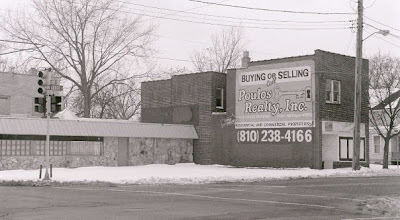 The abandoned buildings are directly across the street from Knoblock Hardware. 1 is Union Print, 1759 N. Saginaw at Harriet. There used to be more of this building, but the southern half has been demolished. I don't think this place is still in business, but I could be wrong. 2 is the old mission on N. Saginaw at Louisa. It has since been demolished (along with the building to the north of it, not pictured) for a new, characterless IRS building. I wish I knew what the building to the left is. It's still there. 3 is the vacant Rite Aid at MLK and Pierson, on the northeastern corner. My mom, who works at another Rite Aid, said the larcenies from there were so bad that the company closed it. Davison and Maplewood might meet the same fate. 4 is the building next to the demolished College Inn, across from The Durant. The front of this building got all prettied up for Semi-Pro, since they were used as storefronts. 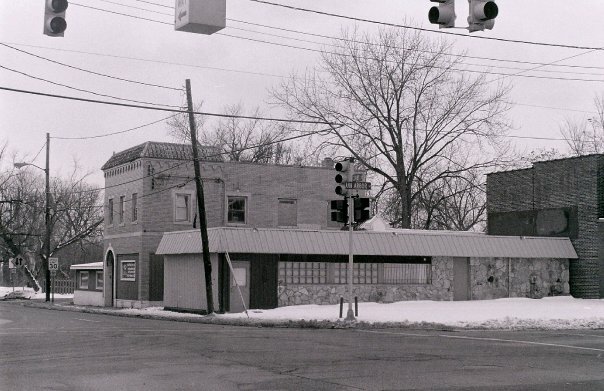 5 is the vacant Seeley's Cleaners, on the southwestern corner of Fenton and 12th. I remember it being open about five years ago. 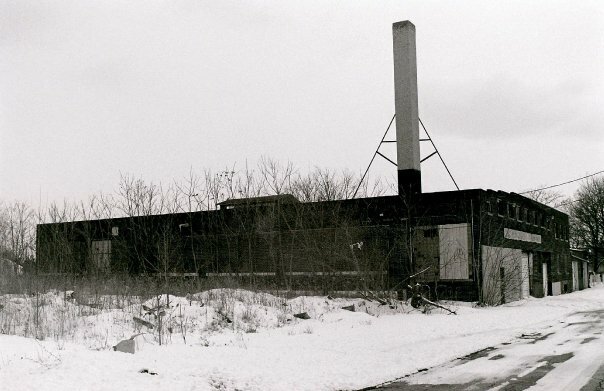 6 is the bean processing plant (I'll buy that rumor) on Grand Traverse, south of Kearsley. My wife and I just got some professional pictures taken in front of it. Someone owns and uses it, since there is stuff inside. When we were there, there was a Dodge Ram parked outside, and a dog up on the top floor. Fun fact: Grand Traverse is a two-way street now, with bike lanes to boot. 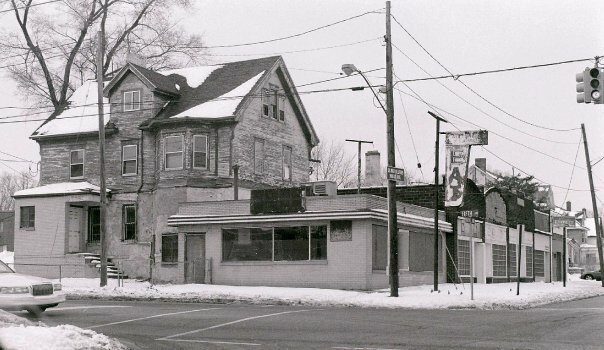 7 and 8 are the northwest corner of Ann Arbor and Court Street. I only remember the short building being a used appliance store about six years ago, but it does look like an old florist. 9 is 3907 N. Saginaw, between Edmund and Myrtle. 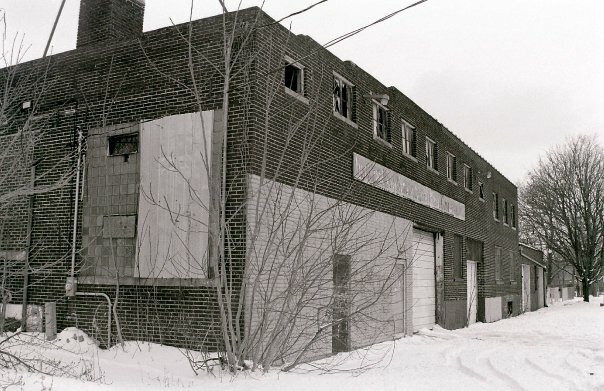 When I looked at old Sanborn Maps, I learned it was an old creamery. Now, it doesn't even have a roof, but surprisingly, it isn't on the demolition list. Look at a street view/aerial view to check it out. 10 and 12 is 1404 Chippewa. It says "National Roofing & Sheet Metal Concepts, Inc." above the doors, though I'm not sure it's still in use. I'm drawing a blank on 11. 13 is the same buildings as 2, but taken from Chippewa Street. 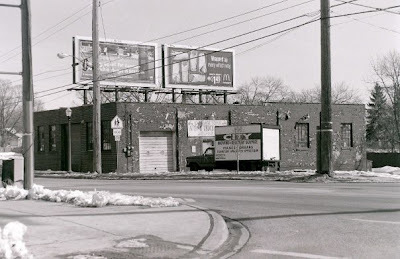 14 is the Otto Liebold meat company at 1025 Chippewa. I couldn't tell you if it's still in business, but I have seen people there, and it's somewhat kept up. We all know that 15 is the old Merlin's Retreat at MLK and Fifth Ave.
16 is Carriage Town Auto & Truck Repair, on the southeast corner of Cadillac and University (formerly Third Ave.). Despite the peeling paint and lack of cars in the picture, it's a thriving business. 17 is the vacant Austin's Paint at Garland and University. For awhile, it said "Coming Soon: Roscoe's Used Tires) on the window, written with white shoe polish. I think it was a joke. The newly opened Witherbee's Market is right behind it. 18 and 20 are the same building at Saginaw and Wood. I didn't know it was a Michigan Bell building at one time, so thanks for that info. 19 is that weird building at Chippewa and Wood. I'm sure it was a Flint school building at one time, but I don't know which one. 21 is at the northeast corner of MLK and Flint Park Blvd. I don't make it up there much, but I think it was last a party store. 22 is the original Gil-Roy's on MLK. I think 23 is on MLK, but I can't remember exactly where. I think it's south of Welch. 24 is the vacant car wash on MLK, near 11th Ave.
25 is Herriman's at Coldwater and Clio roads. 26 is Haskell, which everyone should know by now. 27, 29 and 30 are the vacant dealerships on Clio Road. They haven't been open since I've been paying attention to those sort of things, so I couldn't tell you what they were. 28 is the abandoned Mobil at Carpenter and Clio, northeastern corner. Good job J.L. 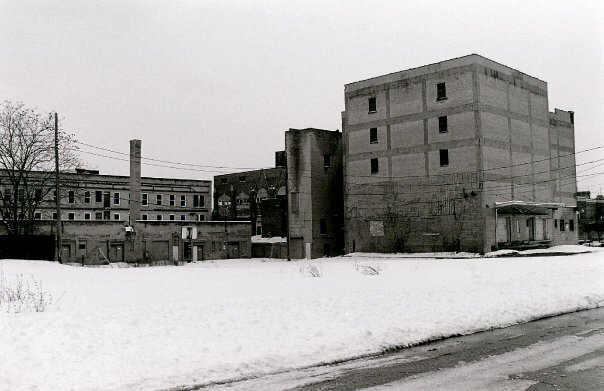 These buildings have changed so much since I lived in Flint that I actually got a C- on the test. Number 11, a structure I know, but can't bring into my minds eye. At one time or another, I've been in almost every one of them. I've got an old meat packing barrel in my garage I use for trash that came from Otto liebold thirty plus years ago. I can't wear it out and it's made cardboard and metal bands. I don't still have the 69 Buick Grand Sport that bought at Jerry Davidson....I sure wish I still did. Thanks J.L! 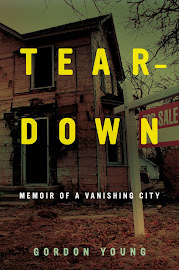 I too live in Flint but don't recognize some of the buildings (although I think the snow and abandonment doesn't help either). The 24 hours in Flint is a GREAT idea! I imagine having a short meeting with the hundreds of potential photographers the day before they unleash their creative capturing powers upon the city. 1. Some might pick certain areas that they know really well to shoot. 2. Another idea would be to randomly assign areas for a group of 20 to capture. A map of the city carved up into square miles...a GPS would come in handy for this. 3.Special award to be given to whoever can photograph the best Flint sunrise/sunset. 5. Special assignment given to anyone who wants to float down the Flint river snapping photos. 8. Interaction with the citizens of Flint. 9. Hangouts, bars, diners, Coney islands, night clubs,Stepping stone falls at night,highschool football games,The Flint Journal, a class at U of M, you name it!! 10. Potentially,tens of thousands of shots can be put together of a 24hr. Some would even opt to record what time the photos were taken. Maybe in the end, all these photos of the 2010 project could be uploaded on a photosharing website. Who is Austin McLogan? The name sounds very familiar. #7 was Curtis Flower shop. 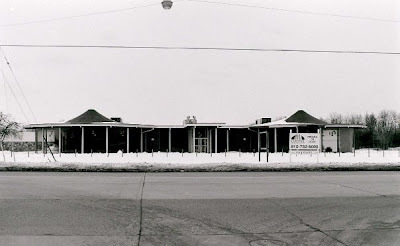 My first job at $1.00/per hour cash in 1975. I had just turned 16.
oh my, Anonymous, I probably worked alongside you at Curtis' Flowers! 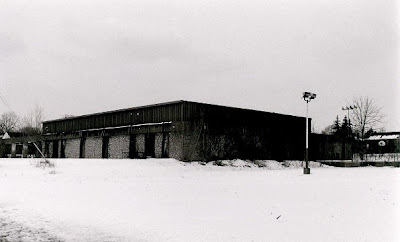 I worked for a few year for the owners of both Curtis' Flowers and their other location, Buck's Flowers, which was on S Saginaw. When I was in the area from 1975-1981, the short building attached to Curtis' Flowers was a convenience store. 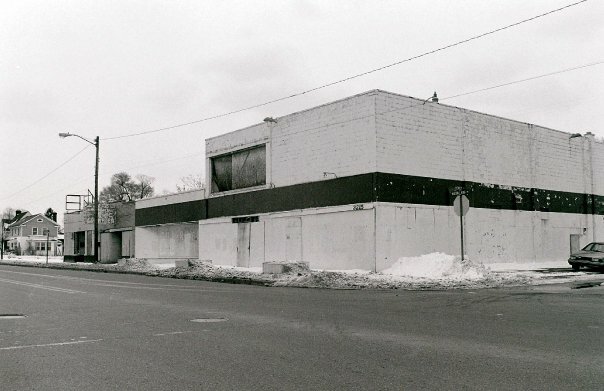 I tried to find the Buck's Flowers building on S Saginaw when I was in town this last summer but it must be gone. Buck's Flowers was torn down in 2007 (?) 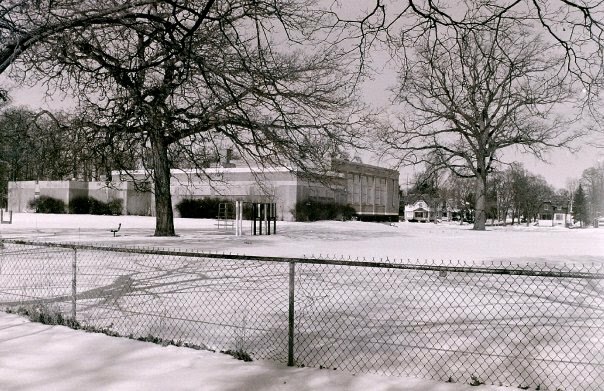 so International Academy of Flint could have another parking lot. No. 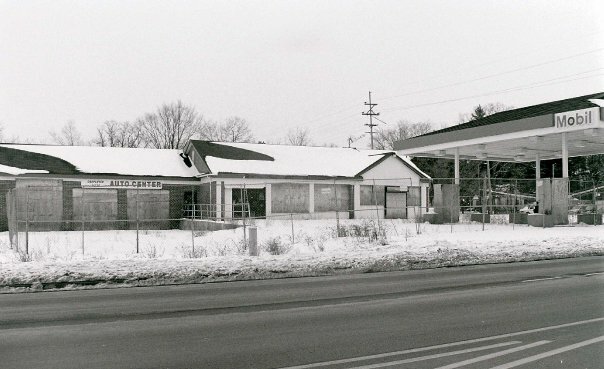 21 was indeed the old 'Stanley's' market on Flint Park Blvd. at Detroit Street. I remember my mom sending me there on my bike to pick up freshly cut meat for family meals beginning when I was five years old. 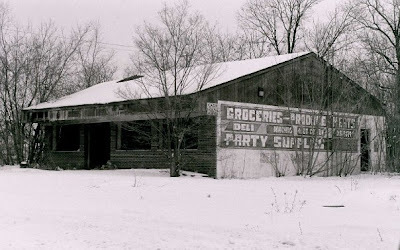 My friend's grandfather, (whose first name was 'Stanley'), owned the store. He was always there, often bagging the groceries himself, and was friendly and genuine to everyone. He was still a daily fixture there when he was well into his 80s, in the mid 1970s, as I recall. Even then, it was a place out of the pre-World War II past. 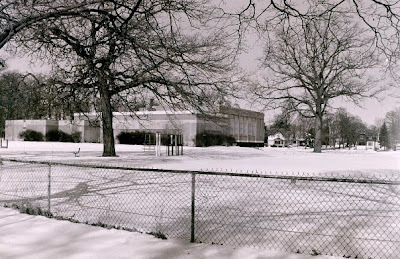 It had a huge 1920s style canvas awning over the sidewalk and an old oak tree, (still there in the photo), that provided mottled shade across the front facade. Inside you found the same inviting, neighborly, old tiime corner store feel and look. A doctor's office occupied the second floor. 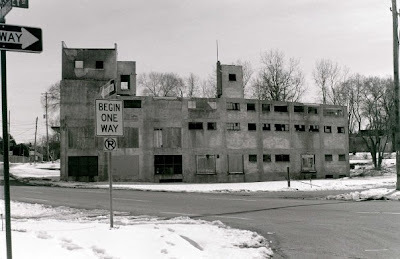 The streets have been widened, the Flint Park street cars have long disappeared, the building details have been obscured by plywood and peeling paint, but if you squint a little, you can just catch a glimpse of the Norman Rockwellesque vision that I remember as real-life Flint. We've made social progress in some areas, for sure...though perhaps less so in Flint than elsewhere. And Norman Rockwell was depicting ideals. But is there anyone that doesn't wonder why today is so socially diminished from the period that Norman Rockwell so perfectly and lovingly memorialized? #27 Is the old Jerry Davidson Buick on Clio road. Lived on Frost St. in the late 60's, early 70's. Bought my 1970 Buick GS-350 from Jerry Davidson. 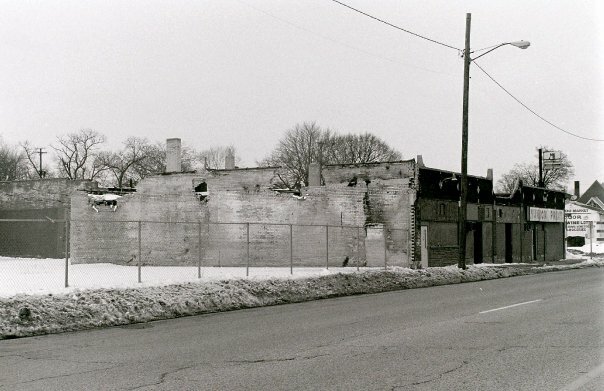 Sad to see the pictures of Flint looking like a war zone. It is very sad to do a drive through of what once was a thriving community. My parents families both were quite large and both lived in the Flint area. 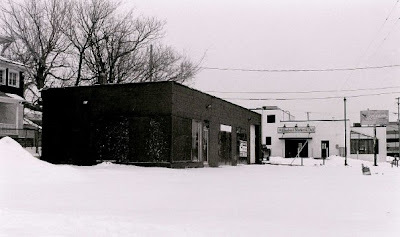 My Dad worked at "The Buick" his entire working life after getting out of the navy during WWII. My Mom worked for an Optometrist in the Mott Foundation Building on the 16th floor. What a once great city with much promise and very generous people. Perhaps I am looking through rose colored glasses, but I have very fond memories of this area up until the late 1960's which is when the tarnish seemed to gain a foothold and it began it's steady downhill spin. I guess that is what happens in a one industry town when the industry is over confident and under competitive pressure. All the things that Flint became used to and dependent upon slowly evaporated and there was not enough diversification to buffer the effects. 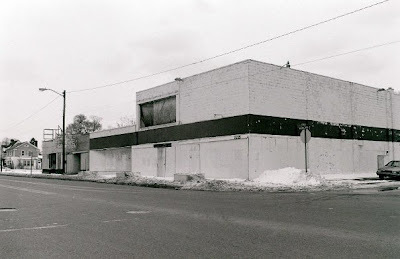 I prefer to remember Flint in it's hay day with Smith-Brigman's dept store, KewPees, The Sloan Museum, The Mott Foundation Building, The Flint Symphony, The Flint Journal, AC Spark Plug, The Capitol Theater, Italia Gardens, JC Penny (when it was down town), Arlan's, The Yankee Store, McDonald Dairy, The Buick Open, WTAC, WFDF, WTRX, WJRT, The Pick Durant Hotel, Churchills bar on Saginaw Street, The GMI Carillon, The IMA Auditorium, Herrimans Dairy, etc etc etc. What a once great city! Do you have a digital version of the photo you could email me? I'd be honored to post it. Email me at gyoung(at)flintexpats(dot)com and we can figure it out. Thanks. Re No. 21, Stanley was my great grandfather and I hear did work into his 80s. A wonderful man. Hey all — no idea if anyone’s pauing attention to this anymore but my family and I used to live in the Hamady Manson. I was born in ‘82, my parents and grandparents bougbt it at city auction in the 70s. My grandfather sold it in the 90s after my grandmother passed away. We have lots of photos and man, what a cool place to grow up. Magical really. I love talking to people about it.